Super Charged Blog: Time for a reunion? Shawne Merriman, was cut by the Buffalo Bills this morning. If you had even a vague knowledge of the NFL 5 or 6 years ago then you will be aware that Merriman used to be a star outside linebacker for San Diego. 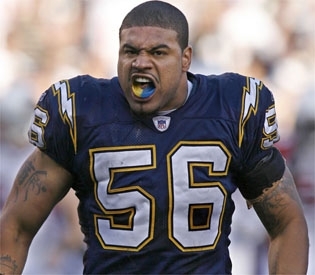 Merriman was a key reason the Chargers were thought of as one of the best defences in the league and formed a lethal pass rushing threat. Unfortunately, from the 2008 season to 2010, Merriman suffered numerous season ending injuries and after such a long length of time spent on the PUP list, the Chargers were forced to cut him. Merriman was given a generous two year contract worth around $10 million problems by the Bills in 2011. This proved to be a mistake for the Bills organisation as Merriman failed to produce anything like what he achieved in previous years in San Diego. Thus today's events are no shock to many people bearing in mind Merriman's hefty wage bill in contrast to his performance. So, like true Charger fans we wonder would it be worth inviting Merriman back to San Diego? Well one thing that is for sure is it shouldn't carry a large risk as Merriman will not be valued much more than the minimum NFL wage. It would also get bums on seats in Qualcomm which is important considering the recent blackout vs Dallas in preseason. It may also benefit Merriman to be back in familiar (and much warmer) surroundings. He would join old team mate Shaun Phillips at Outside linebacker and might be able to rediscover some of his old form. One problem with the move however is that San Diego have little room for an Outside Linebacker with Shaun Phillips, Antwan Barnes, Jarrett Johnson and impressive rookie Melvin Ingram using up most of the playing time. Even Larry English has been impressive and bringing in a player who is thought to be past his prime in for a promising young player would be difficult for AJ Smith to justify. It is also true that Merriman has shown absolutely no signs of his 2005-2007 form and in all likelihood will not show it again. As well as that, AJ Smith is a GM who wants to move on from a player once he has cut them however good they have been for the franchise. This was shown by his reluctance to re-sign LaDanian Tomlinson after leaving the Jets. Overall the move is unlikely and there will be 31 other teams considering taking Merriman on the Cheap. The best thing to do in my opinion would be to give Merriman a week with the practise squad and see how he performs. If he impresses then they can sign him with a cheap contract and please those San Diego fans with Merriman shirts like me! If not they can just release him and move on and at least say they tried. But as we all know it isn't about what I think, it's about what AJ Smith thinks and anyone who can predict what AJ Smith does can phone up NFL.com and get a job because that man is certainly difficult to make predictions about! I just say LIGHTS OUT!! AJ had well documented issues with Merriman's moonlighting jobs and locker room influence after hours and had a THICK book on him. AJ was wanting to move him even when Merriman was good. To even suggest AJ might look, breath or flatulate in Merriman's direction is a stretch!